Chinese startups want to export their bike-sharing revolution all around the world. The companies are rolling into the U.K., the U.S. and beyond, aiming to disrupt existing programs with their fleets of colorful bikes that don’t need docking stations. One of China’s largest operators, Mobike, unleashed 1,000 of its orange-wheeled bicycles in the rainy English city of Manchester on Thursday, marking its first foray outside of Asia. “Manchester will be a springboard into Europe,” said Chris Martin, the company’s head of international expansion. Its big rival, Ofo, got to Europe first, launching a small fleet of its bright yellow bicycles in the English university city of Cambridge in April. Ofo has also been quietly testing bikes in Silicon Valley and San Diego. Chinese startups want to export their bike-sharing revolution all around the world. The companies are rolling into the U.K., the U.S. and beyond, aiming to disrupt existing programs with their fleets of colorful bikes that don’t need docking stations. 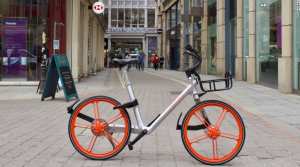 One of China’s largest operators, Mobike, unleashed 1,000 of its orange-wheeled bicycles in the rainy English city of Manchester on Thursday, marking its first foray outside of Asia. “Manchester will be a springboard into Europe,” said Chris Martin, the company’s head of international expansion. Its big rival, Ofo, got to Europe first, launching a small fleet of its bright yellow bicycles in the English university city of Cambridge in April. Ofo has also been quietly testing bikes in Silicon Valley and San Diego. China’s bike-sharing bonanza has led to jumbled piles of bikes dumped outside subway stations and other popular areas. Both Mobike and Ofo say they constantly tweak the locations of their fleets, either deploying workers to physically move the bikes, or offering users discounts or free rides to pedal them to certain areas. Prodding users to help redistribute their bikes is possible thanks to the data Mobike and Ofo collect on the millions of people who use their service daily — they know when bikes are sitting idle, and when high traffic areas need more service. The companies are sitting on a trove of information for market intelligence and insight. Mobike recently announced it is already looking to expand beyond rides, and plans to introduce services, such as deliveries, later this year. It is already testing local commerce deals in select cities, where users can unlock discounts at stores along their bike route by showing their Mobike app. Ofo says it is testing similar services. China’s bike-sharing bonanza has led to jumbled piles of bikes dumped outside subway stations and other popular areas. Both Mobike and Ofo say they constantly tweak the locations of their fleets, either deploying workers to physically move the bikes, or offering users discounts or free rides to pedal them to certain areas. Prodding users to help redistribute their bikes is possible thanks to the data Mobike and Ofo collect on the millions of people who use their service daily — they know when bikes are sitting idle, and when high traffic areas need more service. Related: China’s big Airbnb rival is taking the battle overseas The companies are sitting on a trove of information for market intelligence and insight. Mobike recently announced it is already looking to expand beyond rides, and plans to introduce services, such as deliveries, later this year. It is already testing local commerce deals in select cities, where users can unlock discounts at stores along their bike route by showing their Mobike app. Ofo says it is testing similar services.